I went to college at Oklahoma State University in Stillwater, OK and got my Architectural degree. I got Married to Rick Moon in 1977 in Stillwater and we moved to Houston in 1980. He was in the oil business and I started my on Architecture company while my children were young. We raised our kids here and made our life here. Rick passed away in 2003. I am still working my business and my son Eric works in my business. I stayed close to Moarcia Cumbie all these years and in 2004 she was diagnosed with Pancreatic Cancer and died May 13, 2005. I am very close to her son Logan who is a Freshman at North Texas. I am a member of Faithbridge Church and I am very involved in missionary work. Twice a year I go to Honduras and work along side our missionaries to bring the Word of God to the prescious people I love so much. It is hard to pin down one school story. I went to Ft Worth Christian 7th grade through 12th grade. The tornado that got us the new building and had us attending classes in College Hills Church of Christ is a big part. It was so easy to pull pranks and slip out when we were attending there. Doug French pushing me in the trunk of my car when I had the keys in my hand made for an afternoon of laughs. Me sleeping through Bible class my whole freshman year. (I am really sorry I did that now!) Marcia coming to FWC and all the antics we pulled. All the movies we went to see while we were "selling Adds" or "raising funds" for the New Sign or the paper or the yearbook. Many trips to Mr. Packs office. Steve Flanagan loved to tell on me. The Powder Puff games were the greatest! My junior year and Beverly was the quarterback we were great! Seeing how many people we could get in my big ole Lincoln to get back and forth to the gym. Swimming parties and riding horses. When I look back, all of it was just so much fun. Jackie Barrow Moon has a birthday today. 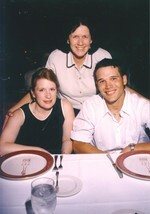 THIS IS ME & MY CHILDREN, ERIN & ERIC IN DEC 2003. ON OUR CHRISTMAS CRUISE(I JUST CALLED BOTH OF THEM AND TOLD THEM WE NEED A NEW FAMILY PIC.) MY HUSBAND RICK HAD GONE BE WITH THE LORD IN JUNE SO HE IS NOT WITH US. THIS IS ONE OF MY FAVORITE PICS OF RICK & ME. WE ARE ON VACATION AT THE GRAND CANYON IN 2002 AND WE HAD SOOOOO MUCH FUN. THOSE OF YOU WHO REMEMBER ME KNOW THAT I AM ALL ABOUT FUN!! THIS IS MY SON ERIC AND MY AUNT GRACE AT THANKSGIVING LAST YEAR. GRACE IS 88 AND WE ARE VERY CLOSE. THIS IS MY BEST FRIEND JANIS, & ME AT THE "WOMEN OF FAITH CONFERENCE" IN OCTOBER THIS YEAR. I DO MISSION WORK IN HONDURAS. I SUPPORT CHILDREN AND GO THERE TWICE A YEAR, SOMETIMES 3 TIMES A YEAR, AND WORK WITH OUR MISSIONARIES THAT LIVE THERE. THESE LITTLE CUTIES ARE TWO OF THE LITTLE GUYS I LOVE. THEY ARE ISSAC & DAVID. WE ARE PLAYING IN THE SCHOOL BECAUSE IT IS RAINING AND THEY JUST CAN'T GET ENOUGH OF THE GRINGO'S!